DONNA — Donna mayoral candidate Ernesto Lugo filed a lawsuit Friday seeking a temporary restraining order against the city and Hidalgo County Elections Administrator Yvonne Ramón. J. Manuel Bañales, a visiting district judge, signed the temporary restraining order late Friday afternoon. The order temporarily halts the city of Donna or City Secretary Laura Balderrama from barring mayoral candidate Ernesto Lugo from voting and becoming mayor, if elected. The order also temporarily prevents Ramón from excluding Lugo from voting in the Donna municipal election. The lawsuit itself alleges Lugo has been “disenfranchised of his right to vote” in Donna, following a slew of events that have unfolded since the city issued a contentious news release on Oct. 12. The lawsuit claims the announcement of ineligibility caused confusion among voters and kept some from voting for Lugo. Lugo said the ineligibility claims are a “desperate attack” by certain “corrupt city officials” who could have resolved the residency claims months ago. He resorted to filing a lawsuit, he said, because he has no other choice. “We need to settle this thing outside the political biases of the city of Donna,” Lugo said of the lawsuit filed midday Friday. 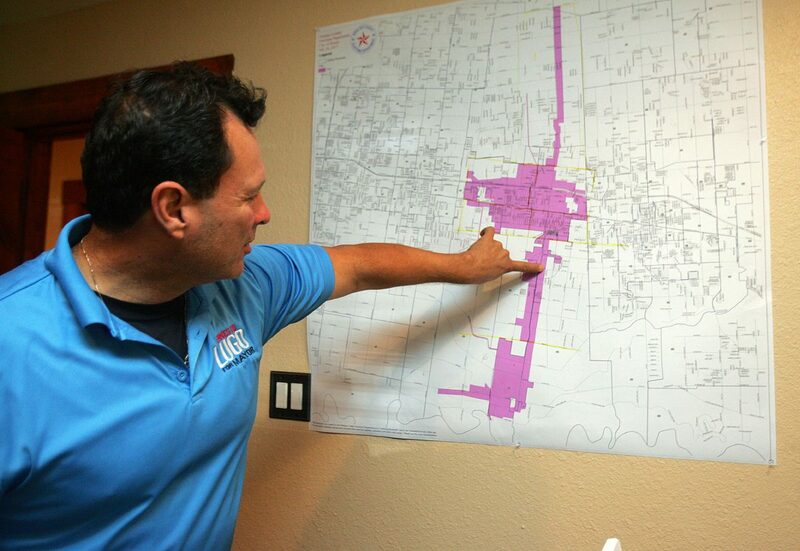 Lugo was listed as a voter in Donna until Oct. 20, when Balderrama contacted the Hidalgo County Elections Department and revised a city limits map that excluded his home from within city boundaries. Balderrama had previously approved a city limits map that included Lugo’s home within city boundaries, according to Ramón. Ramón said cities are responsible for communicating annexations and de-annexations to the elections department. “The election administrator’s decision is based upon the erroneous information provided to her by the city of Donna,” the lawsuit reads. The elections department complies with boundaries set by each city, Ramón said last week. The city contracted the elections department to administer the municipal election. Prior to the lawsuit, Balderrama sent Lugo a letter telling him his candidacy had been “administratively declared ineligible” because of a development agreement now at the center of the residency issue. City Attorney Eddy Treviño remains adamant that the property remains outside city limits because of the development agreement. However, Treviño clarified Thursday that a portion of the Lott Road property belonging to Lugo’s mother and father was indeed annexed into the city in 2013. The city again began annexing property, including the entire Lott Road location, in 2016. It was during the 2016 annexation proceedings when the Lugos signed a development agreement. “ Whatever happened in 2013, in our view … it was undone by the 2016 development agreement and ordinance,” Treviño said Thursday. It remains unclear why the city attempted to annex all of the Lott Road property — including the portion already in city limits — in 2016. The Lugos were never assessed city taxes following the 2013 annexation. Hidalgo County Chief Appraiser Rolando Garza said, as of Thursday, appraisal district records showed Lugo’s home within the city limits. Appraisal district records have been updated reflecting the city of Donna as a taxing entity on the Lott Road property where Lugo lives. Lugo’s voter certificate, the development agreement, maps and his application for a place on the ballot submitted in August were attached as exhibits in the lawsuit. The lawsuit accuses the city of redrawing the lines to purposely exclude the Lugo property from within city limits. District Judge Letty Lopez, who was originally assigned the case, recused herself Friday afternoon. The temporary restraining order may stand until the judge says otherwise. Bañales set a hearing for 9 a.m. Tuesday in the 389th District Court.